Another rehabilitation exoskeleton presented by Dr. Reinkensmeyer aimed to test the importance of the user being able to feel movement. Research indicates that you need to have sensory receptors to make robotic therapy more efficient. If important, it should be most true for the hand because the hand is the richest sensory area of the body. His team created a Guitar Hero-like mechanical glove, which appeared to be beneficial. Something that doesn’t get discussed often but was touched upon at WearRAcon17 was the concept of “slacking.” Dr. Reinkensmeyer explained slacking as the body’s built-in natural tendency to do tasks that require the minimum energy input. When an exoskeleton applies physical assistance to the user, the user will subconsciously start using less energy. Relatively simple control algorithms can identify this and reduce the assistance and bring the user’s input back to desirable levels. Finally, another point that has been gaining a lot of traction recently is the idea of home use exoskeletons that blur the line between assistance and rehabilitation. There is an opportunity to combine assistance with function. Ideally, these exoskeletons will provide enough assistive force for the user to be able to perform day-to-day tasks, but by doing so they are exercising the incapacitated or disabled body part to the extent that they are performing rehabilitation. 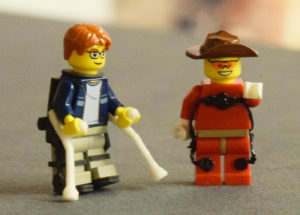 However, the response to rehabilitation robotics is widely variable. Wearable robotics for community living has a 5-10 year lag but has an exponential growth in publications. 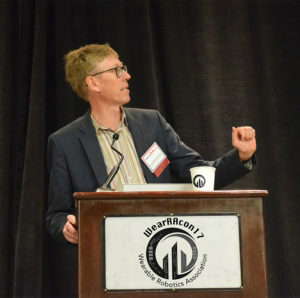 Ideally, the presenters would like to shed the actuators (instead use conductive fabrics, inflatables, etc…) Dr. Walsh emphasized the rise in functional apparel and applications to functional design. This type of logic closely aligns with exoskeleton companies like Myomo and Saebo. Now keep the concept of slacking in mind because just three panels later the audience found out that this effects industrial exoskeletons in the opposite way. Workers tend to naturally execute motions in the most energy efficient manner, but this may not be the safest way or how they were trained to perform the task. If an exoskeleton like StrongArm’s FLx encourages workers to perform tasks in the most ergonomically safe way, their measured metabolic cost may increase. This could also have repercussions on exoskeleton testing by the military, as discussed in the second day of WearRAcon17. 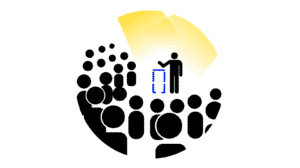 WearRA would like anyone who is a member of the organization to join one or more of its working committees. There are currently two officially advertised ones on their website, but any member can suggest a new one or apply to be part of the planning or value committees. Dr. Tim Swift, Co-Founder of Roam Robotics and PhD in Mechanical Engineering, UC Berkeley, also wants to challenge the community. He would like everyone to build more useful systems, that are cheaper (less than $3,000) and use injection molding because that is proven to be the cheapest way to make things mass manufacturable. He feels that right now the technology is not on the side of exoskeletons. Weight is not the issue, because historically speaking, decreasing weight has scaled down the exo power. According to Dr. Swift, the issue is specific power, and when you scale down the weight you should not have a reduction in power. Roam Robotics is currently working on a prototype inflatable powered ankle exoskeleton that is 800g not including the compressor. Due to the unique application of pneumatic technology, the company was forced to make their own valves and are now designing their own compressor. The Beijing-based exoskeleton manufacturer chose WearRAcon17 day three to make its U.S. debut appearance. 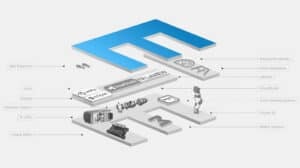 Fourier Intelligence is the developer behind the Fourier X1 lower body exoskeleton designed for rehabilitation and personal mobility assistance. The presentation was led by company CEO, Jie Gu. Funded by the Beijing government and local incubators, Fourier Intelligence consists of a very young team. 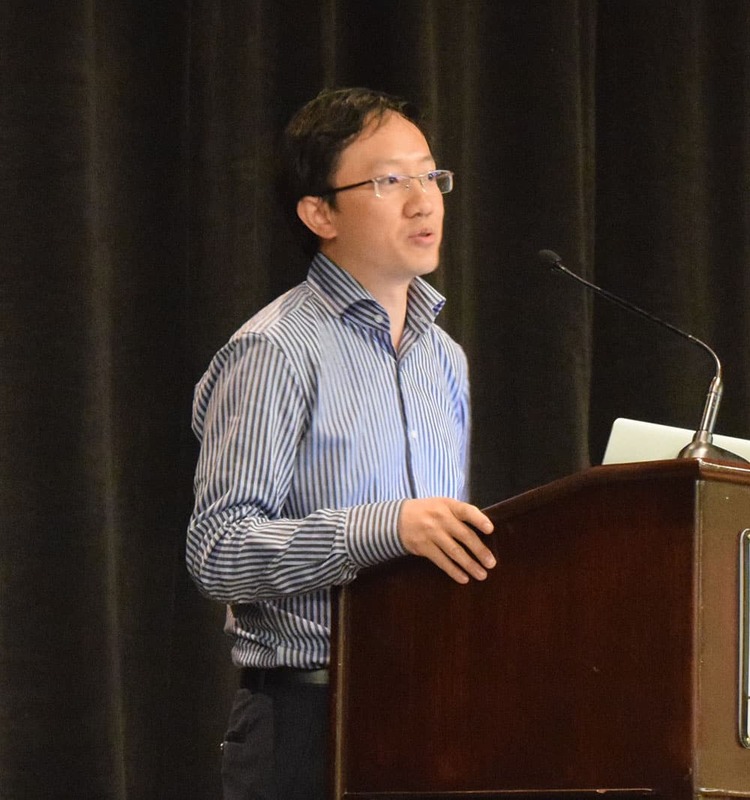 Even so, this is already Jie Gu’s second company (the first was sold-off) and his second exoskeleton project. Initial work started in 2008 with a stationary, fixed frame exoskeleton released in 2013. This stationary exoskeleton utilized seven servo motors, three for each leg and one for gravity assist, a treadmill and virtual integration was sold to another company. Fourier Intelligence then proceeded to design the Fourier M2, an upper body rehabilitation robot that can operate in four different modes. An advancement in the M2 which was then translated to the X1 exoskeleton was advanced haptic sensitivity. Essentially, the sensors and control are so sensitive that the device can maintain contact with a soft sponge in either direction (both towards and away from the sensor) without compressing it. Similar to the theme of this year’s WearrAcon, the business side of the company was also brought up. The Chinese physical rehabilitation demand has outpaced the speed with which new rehabilitation professionals can be trained, creating a vacuum that can be filled using rehabilitation robotics, which includes exoskeletons. About 50 units of the M2 upper body device are already deployed in China with another 200 expected to be shipped by the end of the year. Reimbursement is handled differently in China, there aren’t many commercial insurance companies. If there are a total of 60,000 Chinese hospitals, importing at least one Hocoma Lokomat unit for half of them is already too expensive and inefficient. An alternative is the Fourier X1. It is equipped with the haptic control of the M2, comes with 19 integrated sensors, 11 CPU models, and over torque protection. As other lower body exoskeletons, the X1 uses an integrated push-button controller. LEDs on the joint casings display power use and warnings. A four module battery provides power, two hours of continuous use per module for a total of 8 hours of operational time. The total weight comes to 20 kg (44 lb), but there is still work to be done, like optimizing the gait curve. Alpha tests began with multiple patients just a few months ago. Fourier Intelligence, emphasized the point that reading glasses are an enabling “wearable technology” that was once deemed exotic and unattainable for all but nobility. Reading glasses fix a malfunctioning body part (the eye), and one day an exoskeleton will be no different than glasses. Stay tuned for an ExR exclusive interview with the Fourier Intelligence team. 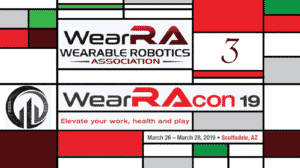 The goal for WearRA is for the wearable robotics field to blossom and work. Does every single country need to have their own gait rehabilitation exoskeleton or could they collaborate? How to get the word out on success stories of wearable robotics being used in clinical and industrial settings? The idea of WearRA and the WearRAcon series is to remove insulation and isolation, not to be an echo chamber but to get real, sometimes critical perspectives. 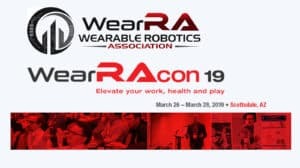 There is a lack of education on wearable robotics and WearRA is just starting to make a difference. 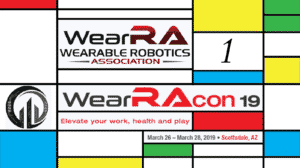 In the end, representatives of 104 organizations from 20 countries attended WearRAcon17! 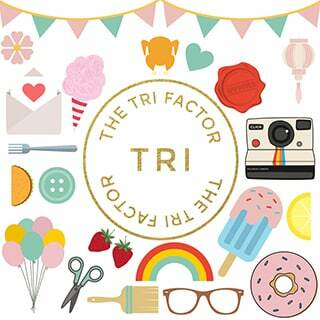 The event was filled with success stories of buying, selling, partnering, connecting, access, and recognition. 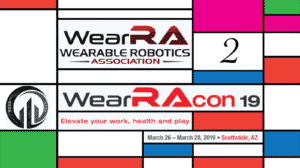 Special thanks to WearRA for making us the official media partner for WearRAcon17!